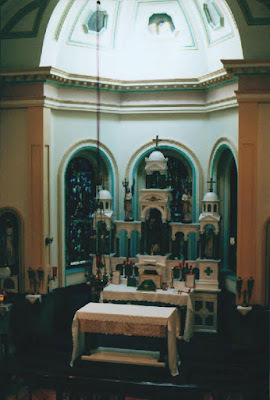 TradCatKnight: Who's Been Changing The Inside of Roman Catholic Churches? And Why? 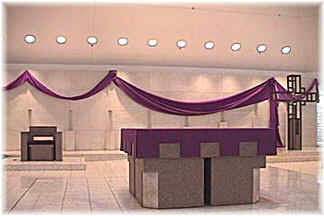 Who's Been Changing The Inside of Roman Catholic Churches? And Why? 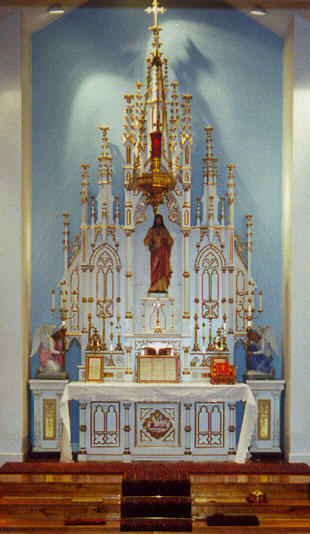 Here are two pictures of an altar in the sanctuary of a Roman Catholic Church as all Catholic churches appeared pre-1958. 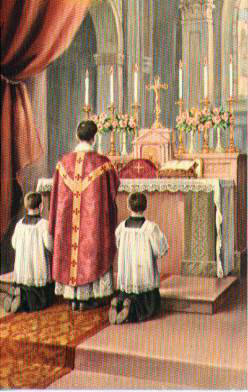 Catholic Churches looked exactly like this going back to the 1500s when Pope Pius V codified the Tridentine (traditional) Latin Mass, and essentially like this back to the time of the Apostles when Mass was said using the tomb of a Christian martyr as the altar. 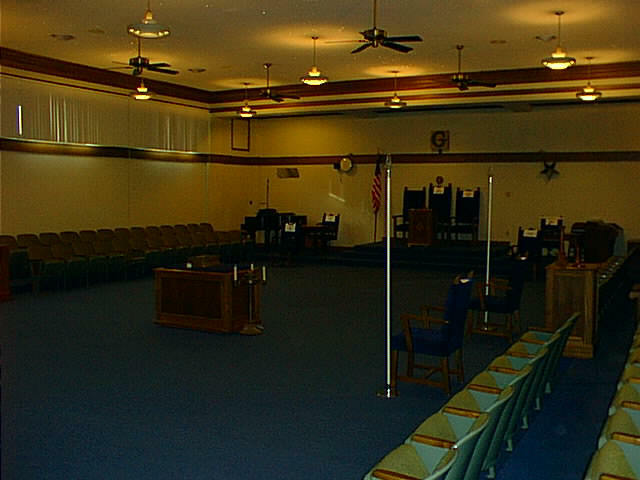 Now look four pictures of "sanctuaries" in Masonic Lodges as they have been for centuries, and as they still are today in 2003. Notice the three chairs where men sit in the central place, as opposed to the central place of the Tabernacle in pre-1958 Catholic Churches. Notice the little table where the presiding officer faces the assembled people, as opposed to a tabernacle or crucifix. The two bottom pictures are from the Masonic Mountain View Lodge 194 in California. Now look at pictures of Catholic Churches as they appear today in all parish churches under the control of a "Vatican II-New Church" bishop. 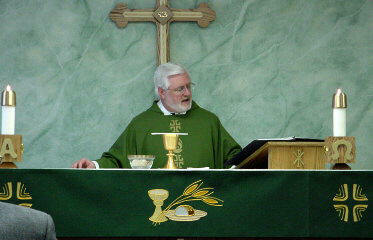 The picture immediately below at the upper right position is from St. Hugo's Parish in Michigan. Both pictures on the right immediately below represent the final goal of the Vatican II "New Church". This type of deformation has taken place at all parish churches which have been subjected to demolition and remodeling since Vatican Council II. The picture at bottom right was taken at St. Jude's Parish in Radford, Virginia. This look is really the final goal of the "Vatican II" New Church; notice the strange and perhaps occult symbolism formed by the windows behind the table in the bottom right picture. Notice that the tabernacle is totally gone from the "sanctuaries" of both churches pictured on the right immediately below. 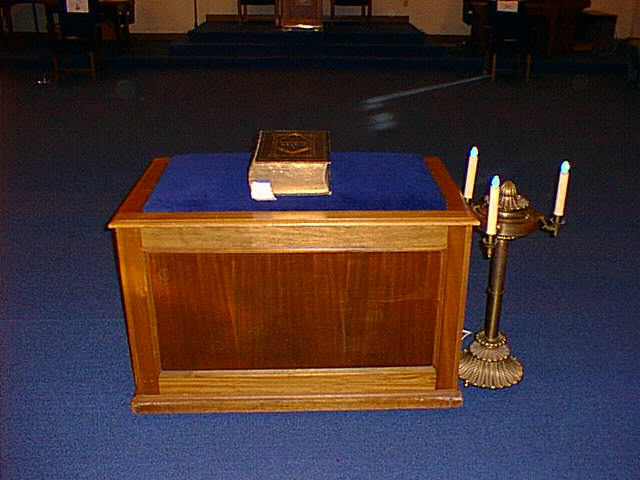 Notice the two forms of the "presider's chair to the back left of the Novus Ordo, or New Church" tables, where a man sits in the place of prominence, instead of Christ in the tabernacle. 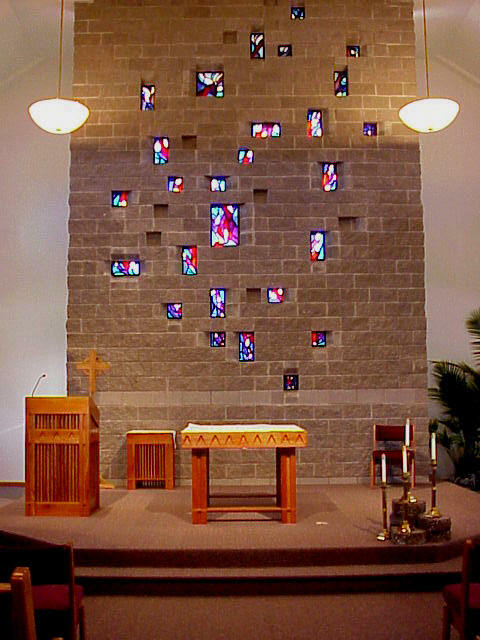 Notice that the crucifix is gone in both New churches, and that at St. Jude's in Radford, Virginia, even any form of a cross is gone. 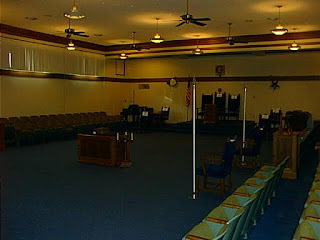 Notice that it is evident in the St. Jude's picture that chairs with no kneelers have replaced the pews with kneelers found in pre-1958 Catholic Church's. 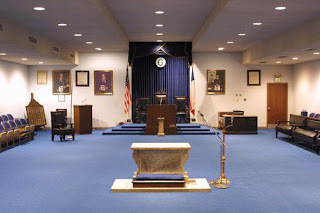 Scroll back up and compare the "post-Vatican II" New Churches below, with the Masonic Lodges, and then with the pre-1958 Catholic Church look depicted in the pictures at the top of this page. Next look at two pictures of Anglican Churches, as they have been constituted for centuries since Thomas Cranmer helped wife-hopper and wife-murderer King Henry VIII replace the Roman Catholic Church with the Anglican Church in England. Catholics attending parish churches will be astounded to find that this is not a modern Catholic Church —it looks exactly like one, replete with the burlap/cloth banners. 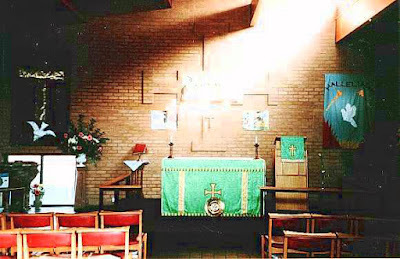 This picture was taken at the Anglican Church in Lichfield, England. 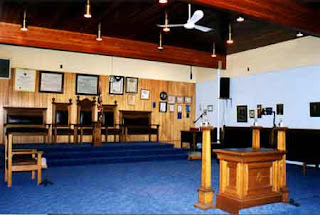 The picture to the left was taken at the Anglican Church in Colorado Springs, Colorado. Catholics will notice that this looks exactly like a New Mass, imposed on the parishes since 1969 by Paul VI, and maintained by John Paul II. Notice the golden cup in front of the Anglican minister—the same "cup" is now found at all New Masses in the parishes—the cup which has replaced the Chalice used during the traditional Latin Mass in all pre-1958 Catholic Churches. And finally, we come to the photos of the UN General Assembly Hall and the UN meditation room. On the left immediately below is the UN Meditation Room. Notice the similarity of the "barren" look and "sterile" feel between the UN Meditation Room, the masonic temples, the Anglican Churches and the Vatican II New "Catholic" Churches. Paul VI knows very well what this "Breastplate of Judgement,' the Ephod signifies; he knows its origins in the ritualistic dress of the Ancient Covenant [that is, the old testament]; he is not ignorant of the fact that Masons today use it as a distinctive mark of their high priest. The Temple of Understanding calls itself a "spiritual United Nations," and is another group that has NGO status at the UN. It was conceived in 1960, and besides Paul VI, other founders and supporters have included John XXIII (photo,below left), Mother Teresa, U Thant, Egyptian President Anwar Sadat, Indian Prime Minister Jawaharlat Nehru, Trappist monk Thomas Merton, the Dali Lama, former-First Lady Eleanor Roosevelt, Dr. Albert Schweitzer, Planned Parenthood's Margaret Sanger, socialist Norman Thomas, séance-obsessed Episcopal Bishop James Pike, and billionaire John D. Rockefeller, who largely bankrolled the seed money for the organization. Just as the United Nations constitutes the precursor of a one world government, so. too, the syncretistic Temple of Understanding can be seen as the basis for a one world religion. The photo below shows John Paul II addressing the UN General Assembly in 1995. He, too, is an ardent supporter of the United Nations, despite its abysmal record of propping up tyrannies (while allegedly championing freedom), trampling upon human rights (while claiming to uphold them), stirring up conflicts (while sending in its "peacekeepers") and the largest and being the world's most visible promoter of the New World Order. Former UN Under Secretary General Robert Muller, a member of the Novus Ordo church who promotes the late Jesuit Teilhard de Chardin's condemned evolutionary theology, is a favorite of John Paul II. Muller, who has been called the UN's "prophet of hope" wrote the "Framework for Planetary and Cosmic Consciousness" and is belongs to ex-Soviet dictator Mikhail Gorbachev's Gorbachev Foundation. He blasphemously has referred to the United Nations as "the body of Christ." As a token of his esteem, John Paul II gave Muller a pectoral cross. Such a statement is consistent with other statements coming out of Rome since Vatican II. John XIII's Pacem in Terris (1963), the call was made "Men's common interests make it imperative that at long last a world-wide community of nations be established." 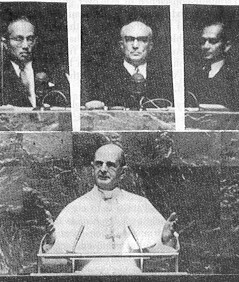 Two years later, Paul VI, during his United Nations speech, would echo this, saying that the UN "is the obligatory path for modern civilization and world peace." He went on to say that the UN should be a "subsidiary world authority" to guarantee "a manner of world government that favors peace" and that "it is time to undertake a constitutional engineering of humanity so that the United Nations can carry out its irreplaceable role." The coming of a world state is longed for, and confidently expected, by all the worst and most distorted elements. This state, based on the principles of absolute equality of men and a community of possessions, would banish all national loyalties. In it no acknowledgement would be made of the authority of a father over his children, or of God over human society. If these ideas are put into practice, there will inevitably follow a reign of unheard-of terror.